We currently have room for more adaptive riding lessons with our PATH certified instructors. Scroll below for the details. Also, we are also looking for volunteers to support adaptive lessons! Email me at laughingbuckfarm @ gmail . com for more information. The adaptive riding program at Laughing Buck Farm delivers equine assisted activities (EAA) and equine facilitated learning (EFL) to individuals with cognitive, physical and social/emotional special needs. Participants will experience horsemanship lessons with PATH (Professional Association of Therapeutic Horsemanship) International certified instructors who are also PATH Equine Specialists in Mental Health and Learning. Along with instructors, students will work with equines in a safe, secured and private setting. Private or group (two or more participants) lessons are available and are designed to meet every participant's needs. I am a New York City native and started riding at the age of five and rode until 22, taking lessons, competing in hunter/jumper and cross-country and training unsuccessful racehorses to jump. I took a 20-year break from riding until six years ago when I became involved with adaptive riding, initially as a parent of a rider. 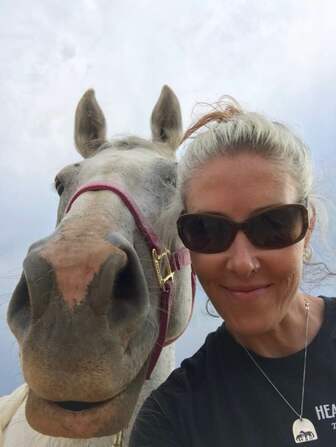 Currently, I am a PATH Advanced Instructor, Equine Specialist in Mental Health and Learning and I am pursuing becoming involved in the therapeutic certification process. I have become extremely fond of English dressage as a riding discipline but love any kind of riding. I especially cherish ride time on my Princess Pony Calypso, a 16.1hh sassy Selle Francais paint mare who has taught me so much. I am a passionate lifelong learner and I love to help people succeed and grow. I love challenges and to travel and should be given a personal GPS tracking device. Liz grew up in northern Michigan and moved to Fort Collins to attend CSU’s Occupational Therapy Program. Her OT career has included working as a school-based therapist for 10 years, as well as incorporating Hippotherapy into her OT practice. She feels fortunate to combine her love of therapeutic services with her love of horses, outdoors and animals in general. Liz completed the American Hippotherapy Association Level I and Level II courses, and is a PATH Registered Instructor and Therapist. Liz loves the outdoors, especially when she can enjoy it with her friends, animals, husband and two kids. We focus on building safe horse handling and riding habits here at Laughing Buck Farm, as well as building a relationship with the horse. We start all students off on the ground, learning how to work safely around horses and ponies, understanding equine instincts and helping kids to recognize the temperament and personality of our lesson horses. Students learn to catch, tie, lead and groom their pony or horse before moving on to riding. We embrace and incorporate many teaching techniques, but we are mostly geared toward Natural Horsemanship, putting emphasis on the relationship between horse and rider and always treating horses with respect. Please come prepared for your lessons wearing long, comfortable pants and boots or shoes with a heel. Tennis shoes and open-toed shoes are not appropriate for riding. You may bring your own certified riding helmet or borrow one of ours. Bike helmets are unsuitable for riding. You may also wear riding gloves, which help the reins to stay firmly in your grip, but they are not a requirement. "Our daughter, Sofia, adores her lessons at Laughing Buck Farm. She has made such wonderful progress and is learning so much about proper horsemanship. We could not be happier!" -Kelly C.
"Laughing Buck Farm has provided exactly the kind of introduction to horsemanship I hoped for my 5 year old daughter. The complete horse and rider are addressed. Natalie has a special way with connecting with children and horses that, in turn , connects the child to the horse." - Ray A.
resulting from the inherent risks of equine activities, pursuant to section 13-21-119, Colorado Revised Statutes.